by Julia Bolzon • I watched Wit this past summer out of my interest in how film can be used to explore bioethical themes, and have not stopped thinking about it since. 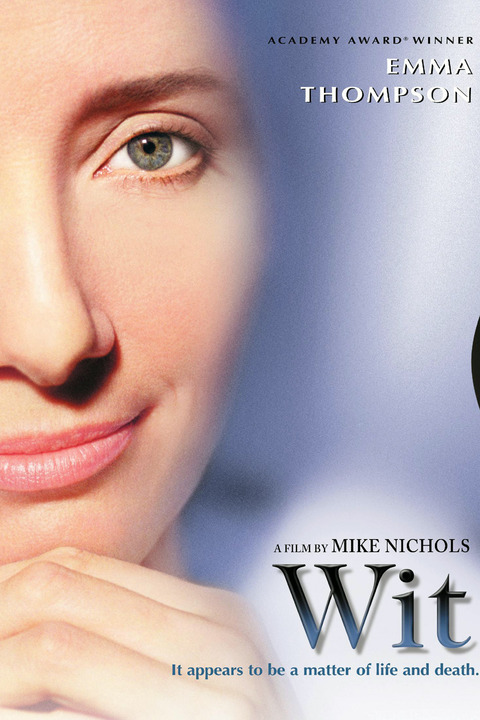 Starring Emma Thompson as Professor Vivian Bearing, who undergoes experimental treatment for stage four metastatic ovarian cancer, the 2001 film is based on the 1998 play by Margaret Edson. I discovered it in the anthologies Bioethics at the Movies (2009) and The Picture of Health: Medical Ethics and Movies (2011), featured for its portrayal of the patient-physician relationship and the drama over the patient’s ‘do not resuscitate’ order. But the film is so much more than these isolated matters. It treats the profound human realities of suffering, pain, and death with sublimity; realities that—when not rejected or ignored—are where man begins to receive answers to his deepest existential questions. Weaving Vivian’s memories with her current reality in the hospital, Wit depicts the existential phenomena that occur in times of medical crisis and at the frontier of death. Such universal moments, when paid attention to, become pedagogic —teaching us something about what it means to be human. Dependency and Need An overarching theme of the film is its portrayal of the human condition in a state of utter dependency and need. By chronicling Vivian’s experimental treatment through first-person narrative, the film offers a window into the world of a patient suffering and dying of cancera reality that remains unknown except through personal experience. Vivian’s condition, however, is not limited to those who suffer with cancer, but instead becomes a lens through which the condition of the suffering patient can be explored and identified with. There are multiple moments where Vivian’s mounting fears are too much for her to bear, and amidst her anxiety she reaches out for human presence by calling for her nurse, Susie. Like a child who is afraid of being left alone, Vivian seeks reassurance that she is not going to be abandoned in her confrontation with death: “Susie? … You’re still going to take care of me, aren’t you?” This is illustrative of the extent to which dying is deeply intertwined with the desire for presence – the longing for a ‘being-with’ – and also with the ability on the behalf of another to exhibit com-passion (to suffer with). As Vivian descends into more frequent episodes of extreme pain, she appears to be almost alien – no longer looks ‘alive’ or human but instead writhes in pain – kept in isolation and effectively forced by her physician, Dr. Kelekian, to continue doing the full dose of treatment. The argument between Dr. Kelekian and Susie over treating Vivian’s pain reveals our varying attitudes to pain-relief in end-of-life care, but also offers a heightened example of what the patient in such a condition may need. Kelekian and his resident Jason are portrayed as indifferent to her pain, whereas Susie is keenly aware and concerned about how her pain is “killing her.” By not identifying with Vivian’s pain, the doctors avoid both communicating with her and being in her presence as she undergoes her pain. The fear of being abandoned, which Vivian experiences deeply, expresses a still-deeper desire that exists for a contact that is person-to-person: an experience of intimacy, belonging, or love that we can only have through the face of another, in the eyes of another, or in the arms of another. This desire is heightened in the moments of pain, suffering, and fear that accompany dying. The Gift of the Dying Person Wit is ultimately about a woman on her deathbed. Yet the film’s unique treatment of the process of dying has much to offer bioethics—that is, how to respond to someone who is dying, and also what there is to receive from a dying person. In a work entitled The Gift of the Dying Person, Ruth Ashfield notes that the dying person “is a visible reminder … [of] the deepest questions of meaning hidden in every moment of suffering,” which we often avoid or struggle to face. Yet in paying attention to the dying, choosing to stay and suffer-with them, there is something to be learned, as demonstrated by Susie. She does not remain unaffected by having to care for Vivian, allowing herself to enter in to Vivian’s life: first her life as a scholar ripped from her work and confined to treatment, and slowly into her suffering and pain, sharing moments with her, like their conversation over popsicles, or the moment of joy and laughter over ‘soporific.’ They are small, simple gestures; yet they speak volumes in terms of responding to Vivian’s loneliness and craving for company. In front of the mystery of suffering, and the mystery of death, Susie “accept[s] the opportunity to face the same deep questions of meaning … allowing [her] own need to search for the foundation of life to be reawakened.” In her conversation with Jason over Donne’s “salvation anxiety,” she wonders: “what happens in the end? … Does [Donne] ever get it? … Do you ever get to solve the puzzle?” Here we see her attempt to face the thick and weighty questions of life and death, and the meaning that they bear, especially in the presence of a dying patient. In contrast, Jason’s response is to “forget all about that sentimental stuff,” because thinking about the meaning-of-life all the time would make you go nuts. But what does such an attitude towards death and pain result in when it comes to treating his patients; one that steps back and chooses “not to think about it” rather than entering into and suffering-with? Unlike Susie’s struggle to make sense of what happened to Vivian, Jason remains detached from what Vivian undergoes, so much so that there is a distinct depersonalization during most of his visits with her. In Jason we see the drive for ‘knowledge’—a wish that all patients would “go full throttle”—culminating in the horrific final scene where he attempts to resuscitate Vivian’s dead body, in defiance of her code status. Metaphysics, Mystery, and Art A final layer to the film’s pertinence to bioethics is the very way in which it portrays the realities of death and suffering: through art. The mysteries of suffering and death contain an essentially metaphysical nature, and as such, they are not realities that can be dissected, calculated, or solved. Rather, one can explore their meaning through a medium that requires contemplation and imagination, as the film does through the motif of poetry. This is exemplified through having the protagonist be a scholar of John Donne’s metaphysical poetry, who “explored mortality in greater depth than any other body of work in the English language.” Through the use of symbolism, allegory, and poetry, Wit conveys a certain reverence and awe towards the mystery of death: that it is not a problem to be conquered or eradicated (“acted out on a stage”), but embraced as a passage – albeit an inexplicable one - into ‘life everlasting’. A Fitting Gesture And yet, what does one say to someone who is dying? What does one do? An aversion accompanies being at death’s bedside; “there is something intolerable about pain and suffering when we cannot cure the person. No one wants to be with people in pain, unless they can do something to alleviate the pain.”  In the film’s penultimate scene, we are offered a thread of beauty and hope—a way of being with the dying that does not reduce or undermine their condition, but responds to it fittingly. After an entire eight months with no visitors, making her way down the wing is the elderly E.M. Ashford, who sees Vivian in her irreparable state. Ashford coos over Vivian like a mother soothing her crying baby, and in a gesture full of meaning and sympathy, she gently climbs into Vivian’s bed and holds her, letting her cry onto her, simply repeating her name in an attempt to comfort. This is all one can offer, their mere presence, as a gesture of love. At the end of life, we are brought back to simplicity, vulnerability, and a child-likeness that can only be responded to with tenderness. In some mysterious way, Ashford’s reading of The Runaway Bunny captures Vivian’s return to being like a child: vulnerable, dependent, and needy. This return to a child-like condition is alluded to halfway during her treatment, where Vivian reminisces on the exact moment she knew words would be her life’s work. Vivian is depicted as physically returning to being a child, in her hospital gown, bald-headed, huddling over the same book like when she was a little girl and struggling to read the words. This memory serves as harbinger of the return to our original condition of dependency at the end of life, a condition of being in relation to others that we never really exit from. As the final scene fades out with Vivian’s voice reciting Death, Be Not Proud, the total effect of the film leaves an impression of the meaning of life and death, past and present that remains long after the final scene has ended. References  Many of the film’s artistic merits that I discuss are due to Edson’s play. Jason is adamant that she’s “tough,” “she can take it,” and Kelekian says that ordinarily, they would give the patient control of their pain management, but in Vivian’s case no. Margaret Somerville explores attitudes to pain and pain-relief in her book Death Talk, revealing that there can exist a tone against pain-relief for various reasons – that patients are “complainers,” fear of their becoming “addicted” to morphine, or a general indifference to suffering. C.f. Somerville, Margaret. Death Talk: The Case Against Euthanasia and Physician-Assisted Suicide. McGill-Queen’s University Press. 2001. 218-223. A story I read recently depicts a patient dying of cancer in an isolation room, screaming of pain, whom the nurses avoided because there was nothing left for them to do, as much as they wanted to help. The visiting chaplain entered her room, got down on his knees, and started screaming with her, holding her hand: “She screamed, “Oh God!” and he screamed, “Oh God, help her! Help her!” At least she knew that someone was praying with her. … At a certain point she changed from “Why, oh why, God? Oh, stop, stop!” into “I offer, I offer, I offer it!” In the last moments of her life, despair became hope.” See: Lynch, Jonah and Michelle K. Borras. Technology and the New Evangelization: Criteria for Discernment. 2012. http://www.kofc.org/un/en/resources/cis/cis419.pdf  Ashfield, Ruth. The Gift of the Dying Person. Communio International Catholic Review. Volume 39. Fall 2012. 381. http://www.communio-icr.com/files/ashfield39-3.pdf  Ibid, 393-94. Another example is how the presence of suffering is symbolized by the Renaissance icon of the martyr St. Sebastian: painfully depicting him tied to a post and shot full of arrows. Sitting on Vivian’s bedside, it is the only thing of colour in her hospital room, and we see it almost floating in the background as she first muses on her cancerous condition. It is actually a miniature version of the life-size one hanging on the wall of her mentor’s office, which we see fill the background when E.M. Ashford is lecturing Vivian on the meaning of Death, be not proud. The repeated presence in the film is a reminder of the inherence of suffering to life. Quote from Jean Vanier, a man who devoted his life to being with the vulnerable, weak, and those who suffer in the form of physical disabilities. The full quote reads: “There is something intolerable about pain and suffering when we cannot cure the person. No one wants to be with people in pain, unless they can do something to alleviate the pain... When all is said and done, in L'Arche there are no cures. What people need when all the therapy has been tried is a friend who is faithful, who stands by them, a loving milieu where they are respected as full human beings....” Vanier, Jean. Letter to My Brothers and Sisters in L’Arche, 1996. “Even when we feel that we can do absolutely nothing, we will still have to be prepared to stay. ‘Watch with me’ means above all, just ‘be there.’ … There is a response to the “why?” of suffering, and it is a response not of words or explanations, but of presence” Ashfield, 388.